HARLEM — The owners of businesses near the building explosion that killed eight people earlier this month told city officials Tuesday morning that they need an immediate infusion of cash because the disruption to the area had seriously hurt their livelihoods. "What I want right now is financial help," said Mounir Najd who owns The Kiosk, a Moroccan and Mediterranean restaurant on 116th Street between Park and Madison avenues, and Adar Lounge, on Park Avenue between 115th and 116th streets, after the closed-door meeting at the 25th Precinct in East Harlem. "I need to open and get back in business," he said. About 60 ground-level businesses were harmed by the blast and subsequent street closures, including four nonprofit organizations, the New York City Department of Small Business Services Deputy Commissioner Robinson Hernandez said. Twenty-two businesses were damaged, including four that were destroyed or suffered heavy damage. Gabriel Garcia, 33, an employee of J. Homeboy Sneakers on the corner of 116th Street and Lexington Avenue, said the store normally has more than $1,000 per day in sales but that has dropped dramatically after the street closures. Even though barricades were taken down last week, customer traffic has not returned to pre-explosion levels. "They are scared," Garcia said of the customers. "They don't want to think about something like that happening again." Fallou Samb of Touba African Market Dress Flavor, a grocery and clothing store on 116th Street between Park Avenue and Madison Avenue, said it has cost $33,000 to get his business open again after the glass windows were blown out by the explosion. "Everything, milk, water, palm oil was spoiled. I had to throw it away," said Samb who reopened his business three days ago. He said he left the meeting unsure of exactly how the city could help him. SBS staff went out to meet with each affected business owner and each was assigned a representative to help. Businesses may need everything from help with accessing their insurance to a report from FDNY. "Our goal is to get these businesses back on their feet as soon as possible," said Hernandez. Hernandez said it was still too early in the process for the agency to give out any available grants or loans because detailed damage assessments were necessary. That irked business owners like Najd. "I'm not asking for free money, just a loan to help me out during this rough time," he said. Dimitri Gatanas, co-owner of Urban Garden Center, which was destroyed in the explosion, said he was "totally skeptical" before the meeting but "pleasantly surprised" afterward. "A lot of small businesses don't know the resources available to them," said Gatanas, who has not been able to fully access his store across the street from the buildings that exploded. SBS hosted the meeting with several city, state and federal agencies. City Council Speaker and area councilwoman Melissa Mark-Viverito was also present. The meeting, which was originally supposed to be open to the media, was shuttered. The speaker's office blamed security concerns voiced by police officials. 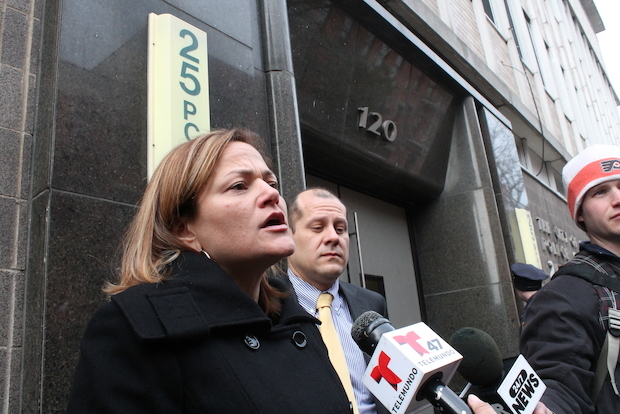 Mark-Viverito said the city was taking steps to help area businesses by connecting them with city services. Other business owners such as Chris Constantakis, who owns Christina Wines and Liquor at Park Avenue and 116th Street, said he's being proactive to get business back after closing for a week after the explosion. The store lost $5,000 between the damaged alcohol bottles and the busted windows. The windows have been fixed and the liquor replaced. This week, Constantakis began offering discounts and specials and remains optimistic. "The only thing I need is for customers to come back," he said.